Detroit is the Motor City, so you better believe we take our Auto Show seriously! If you are a car enthusiast, you have to stop by! See the latest models that manufacturers are offering, as well as incredible concept cars that will give you an idea of what the future holds. Cool displays and demonstrations are great for everyone, even if they don't know anything about cars! The NAIAS Charity Preview is an amazing party held before the show opens to the public. Ticket holders get a sneek peak at what the car industry has to offer. It is a black tie gala that raises funds for charities in the area. 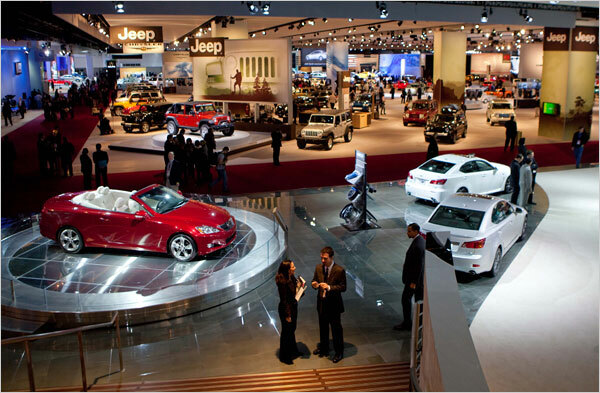 Enjoy musical performances, entertainment, and the first glance of the NAIAS! When you take a trip to the auto show, you'll see that Detroit means business when it comes to vehicles. Our city works hard to bring automotive innovation to the table, and your support of the auto show helps them to accomplish this. Be sure to secure a mode of transportation for the auto show, as it's a hectic time to be driving downtown! Aside from not having to deal with the traffic of the auto show, a limousine or party bus does more than give you a professional mode of transportation to fall back on. You won't have to find a designated driver or round up the whole group when you have a limousine or party bus! Best of all, you'll be making an impression as you stroll through the city. Rent a limousine or party bus for your next auto show experience!